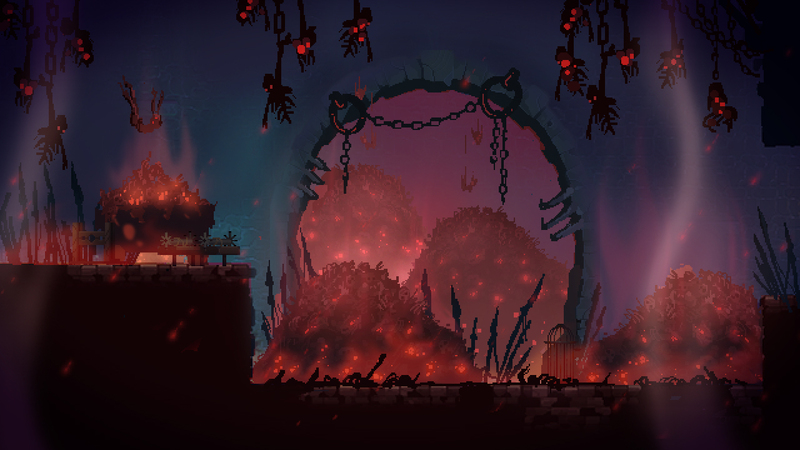 Dead Cells is a roguelike, Castlevania-inspired action-platformer, allowing you to explore a sprawling, ever-changing castle… assuming you’re able to fight your way past its keepers. To beat the game you’ll have to master 2D souls-like combat with the ever present threat of permadeath looming. No checkpoints. Kill, die, learn, repeat. Roguevania: We love Castlevania type games and Roguelikes so we decided to take the best of both and put them together. Our procedural generation algorithm provides a fair amount of diversity while we make sure the level design is always enjoyable. We’re aiming to offer a different experience in each and every run and still give the world a meticulously handcrafted feel. Combat: Bosses and minions’ attacks are pattern-based. Jump, duck or roll to dodge, and bring them to their knees, using stacks of weapons and spells, each one with its own unique gameplay and art. We like to think that our battles are tough, but fair, and designed for players looking for a challenging but rewarding experience. Nonlinear progression: Instead of having x numbers of levels to go through in a specific, rigid order, we would rather leave some room for the player to choose their path. For instance, you could reach the dungeon, by taking on either the tower level or the sewers. 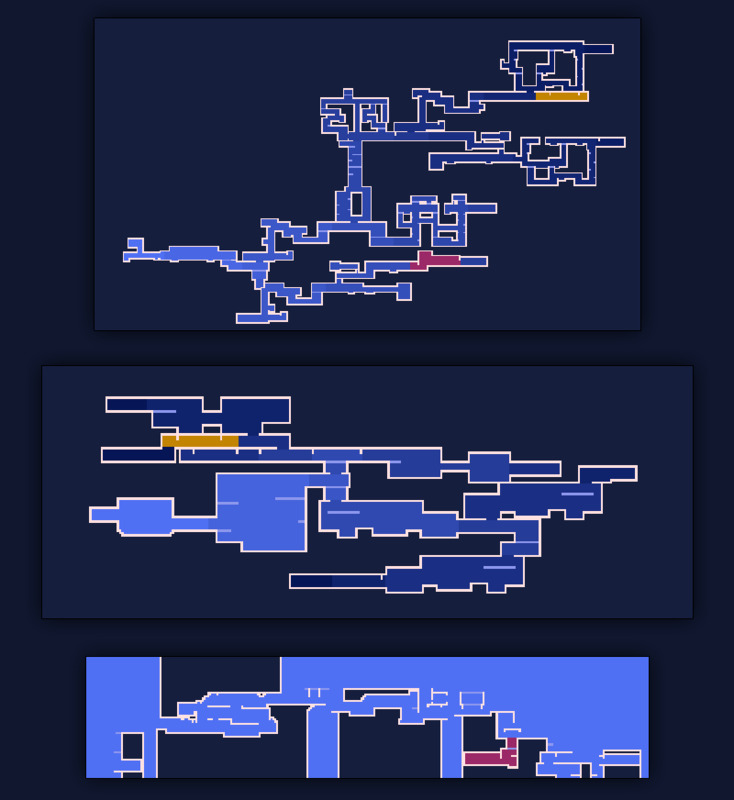 Some paths will be shorter but harder, or maybe the level-design will be more suited to your playstyle. So, it’s up to you to choose your strategy. Loot: Adapt, adapt and adapt yourself again. You won’t have your weapon of choice each time, so be prepared to make do with what you find. It will probably still be rad though. Exploration: Of course, we’ve got the old “secret rooms and hidden passages” thing, but that’s not the only trick we’ve got to make you happy while exploring our world. Thomas and Gwen, our graphic artists, take every opportunity they can to craft something that’s going to make you want to stop and look around for a while. Because nothing says « permadeath, action-platformer and frenetic killing » like the nostalgic panorama of a beautiful sunset. A mysterious, heartwarming, well written and taking on current political issues story: No no no… This is a roguelike! Piece together the lore of this broken world as you strike up conversations with NPCs, dig through old chests and take on the various bosses of the castle. What’s going on here? Who are you and how did you get here? It’s all very mysterious (mostly because we haven’t finished writing the script ). We all love hand drawn pixel art animation. But Thomas was all alone (bad joke) at the beginning, so he chose a production method that gives us that awesome pixel art finish, without having to hand draw retake. Drawing inspiration (excuse the pun) from King of Fighters, Blazblue or the last Guilty Gear, the smartest way to go seemed to be making the most of 3D animation. Start with a rough draft in pixel art, then move on to the modeling, skinning and rigging, before adding the animation and exporting a 2D spritesheet. This allows you to make super fast changes to the pixelart animation while maximising reuse of existing assets. It’s a one man band. A long time ago, Dead Cells was born as a F2P browser based, tower defense, co-op game. A year and a half of small tweaks to the game design later, things have changed. We are Motion Twin, a French independant studio established in Bordeaux in 2001. We’ve developed a bunch of browser games, and now we’re stepping into the unknown with our first B2P PC/Con/sole title. The animations look really good! I was amazed when I saw the smoothness of that spear animation. On a sidenote, when do you think heaps will be released? Like when will it gets its own website, forums, etc. It seems like a really awesome engine, just a bit obscure atm. As an avid fan of roguelikes, Metroidvania games and prerendered 3D sprites (e.g., DKC, Killer Instinct etc), I absolutely have to tip my hat to you. This looks glorious. Oh my gosh. Uses haxe, has amazing art, made by motion twin. http://deepnight.net ? This looks really good. I'm curious on a procedural content level to see (if you're willing) a small portion of a map. Fantastic art and I really like that you can take different paths to reach a point. Thanks a lot for the feedback I'm working on this project as a dev & gamedesigner (depends on the day). Pretty great visuals. I like when level generation is customized to fit level theme (sewer, roofs ...). The player can know what to expect in the level but not the details, like in Nuclear Throne. I explain games to people. If you want to try it anyway, just bug the hell out of him on twitter/github, that should motivate him! Nice to see you here guys! Best luck with this project, it's so great! The term "mass grave" has, in my mind, negative connotations linked to World War II and even more recent conflicts (I'm not only referring to the Holocaust, many civilians and soldiers were also executed or buried postmortem in mass graves). A somewhat gentler term would be catacombs. While catacombs are creepy, they tend to evoke less visceral feelings because they are so ancient and removed from any recent tragedy. Just my two cents. It also depends on your lore. Catacombs are kinda for peaceful religious burying, not necessarily a result of a massacre. If the backstory for the location does refer to some kind of slaughter, mass grave might be more appropriate and frankly it makes it more creepy and disturbing, and it breaks the mold a bit (since pretty much every roguelike has catacombs). Catacombs also consist of tunnels and chambers, while mass graves are just buried. Again - there's lots of overlap between the terms but there's still a clear difference imo. PS: If there was a battle there you could also call it an ancient (haunted) battlefield, like the Dead Marshes in LOTR. Wow this is absolute sick. If you don't want to use "mass grave" maybe something along the lines of "burial chamber", etc could work? Depends exactly what you're trying to convey. This is gorgeous; I can't wait to see its progress! I love everything that's going on here; art, animation, genre, idea, everything! Yeah I agree that 'Mass Grave' should be fine given the context. Alternatively, you could stick a bit closer to the French and go for 'Charnel' or 'Charnel House.' That last one would be my pick, I think. This all looks awesome, by the way!